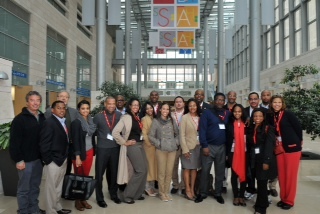 During their visit to Hadassah Hospital-Ein Kerem, a delegation of African-American community leaders from southeastern United States met with Dr. Cobi Assaf, recently retired head of the Department of Emergency Medicine, and toured the Department of Pediatric Oncology and Hematology in the Charlotte R. Bloomberg Mother and Child Center. Their mission was organized by the American Israel Educational Foundation, the charitable organization affiliated with the American Israel Public Affairs Committee (AIPAC), and arranged by Hadassah’s Influentials to Israel Program. They are pictured in the David and Fela Shapell Family Gateway to Health at the entrance to the Sarah Wetsman Davidson Hospital Tower.